A nut with a finished top that covers the end of the bolt. 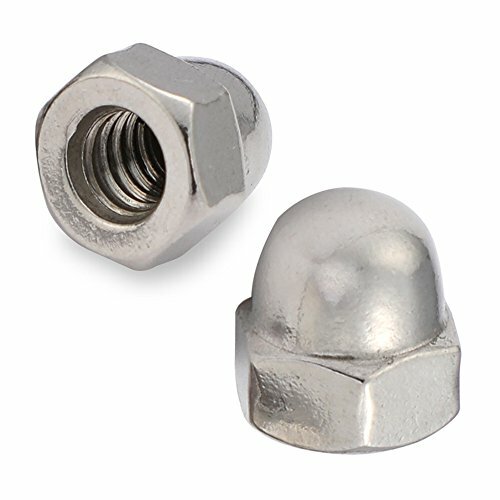 Cap nuts work with connector bolts for surface to surface application. Use these with 3/8-16 connector bolts. The stainless nuts are 100% stainless steel 18-8 (304) which offers a high level of chemical and corrosion resistance. The corrosion proof steel, makes them last much longer than screws made of common materials. MewuDecor stainless six sided nuts are great for general applications and wet environments. They are strong, corrosion proof, and will support all of your project purposes. So confident that our hardware is the highest quality available on the market, and we make every details perfect. If you have any questions about this product by MewuDecor, contact us by completing and submitting the form below. If you are looking for a specif part number, please include it with your message.